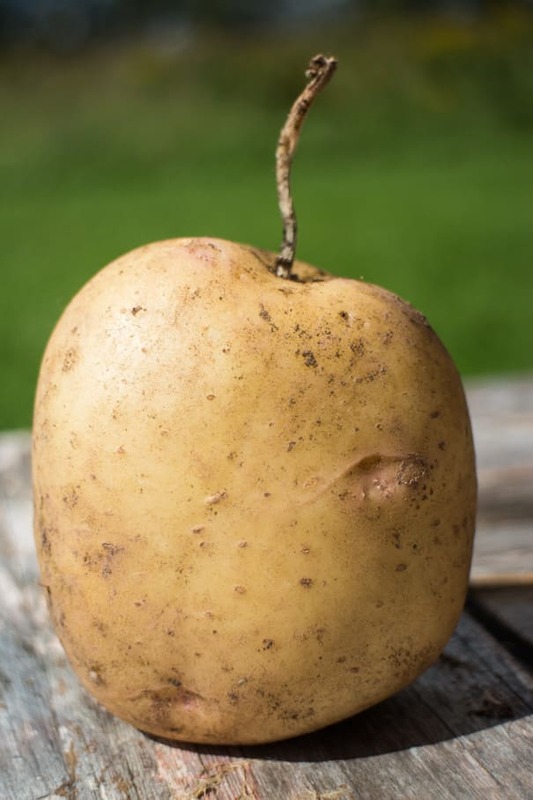 We Planted Potatoes and Came Back 3 Months Later - Grow Potatoes! Creamy Slow Cooker Sweet Potato Soup Recipe - Easy to Make! We planted potatoes and didn’t do ANYTHING else. We didn’t water, didn’t mound the dirt, nothing! 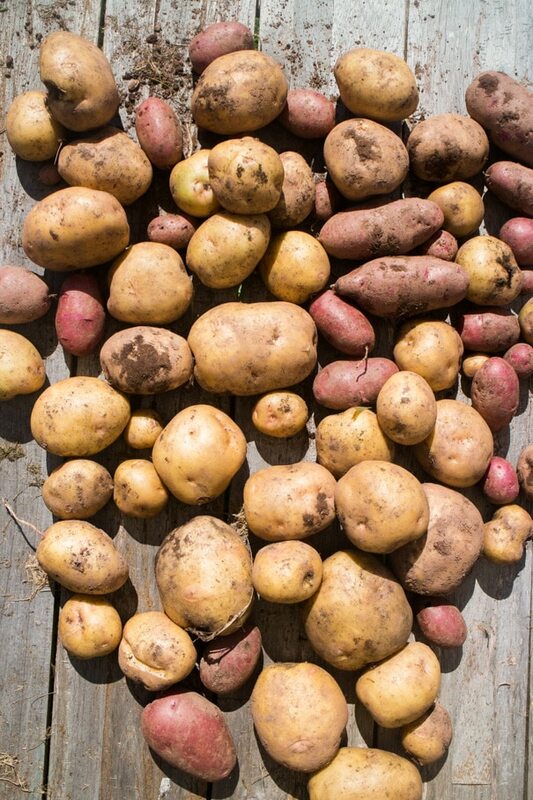 Learn how to grow potatoes, and how many pounds of potatoes we had waiting for us! Sometimes people ask me what are the easiest vegetables to grow. Usually I tell them lettuce, kale, radishes and jalapeno peppers but now there’s a new one to add to the list… maybe the top easiest one to grow! What is it? POTATOES! Would you guys believe that we planted these potatoes 3 months ago, did NOTHING, and then came back to find dozens of beautiful potatoes waiting for us to dig out from under the soil? Well I hope you believe me because that’s what happened! This year we are primarily focused in gardening in Brooklyn, with nothing growing Upstate. Matthew and I were kind of sad about this, so Matthew made the drive Upstate to plant a few potatoes. We hoped that we could visit in mid Summer, but our schedules just didn’t allow us. So after 3 months of not visiting the garden Upstate, not doing anything to the potatoes, we finally visited last weekend. At first we were dissappointed because we couldn’t find the potato plants (they were competing with some weeds!). Matthew continued to dig around and still couldn’t find anything. 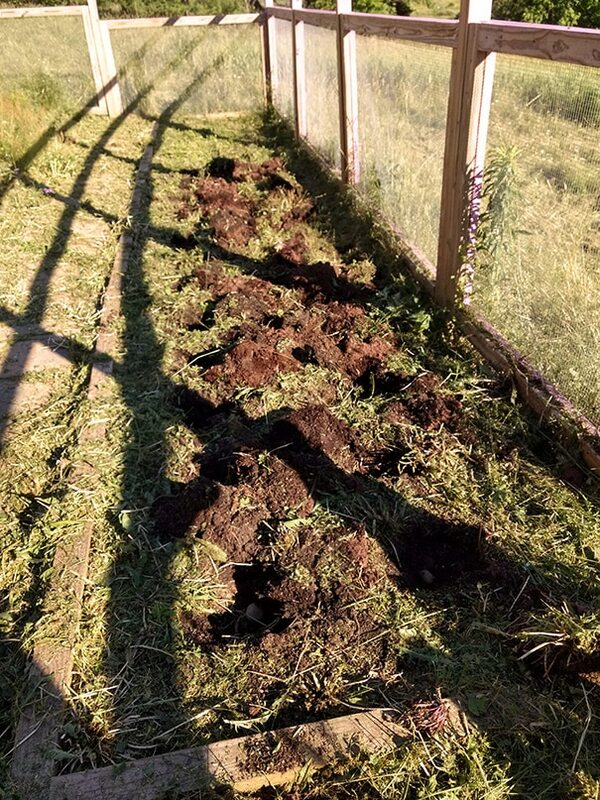 But then he dug a little bit more (with me anioxusly yelling FIND THE POTATOES!) and ta-da! 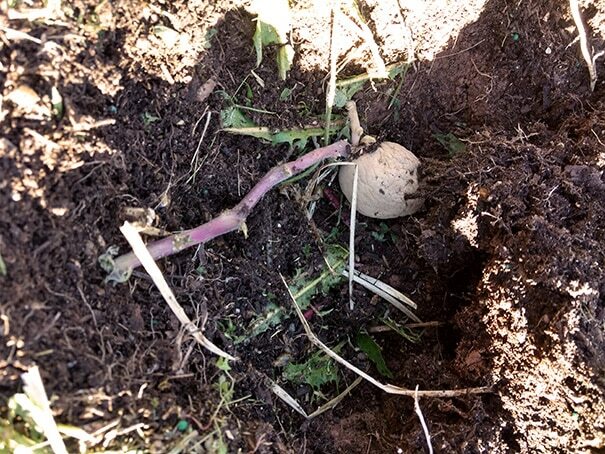 There were so many beautiful potatoes growing under the soil! 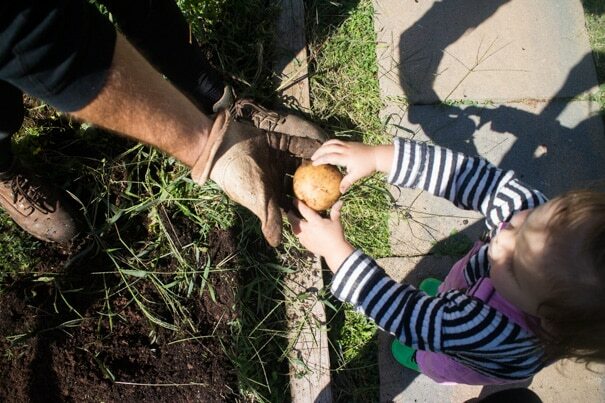 Here’s a picture from late June when we planted the seed potatoes. We planted both Red and Yukon potatoes. Because this bed wasn’t being used for anything else, we just dug holes all over and planted a whole bunch of potatoes! 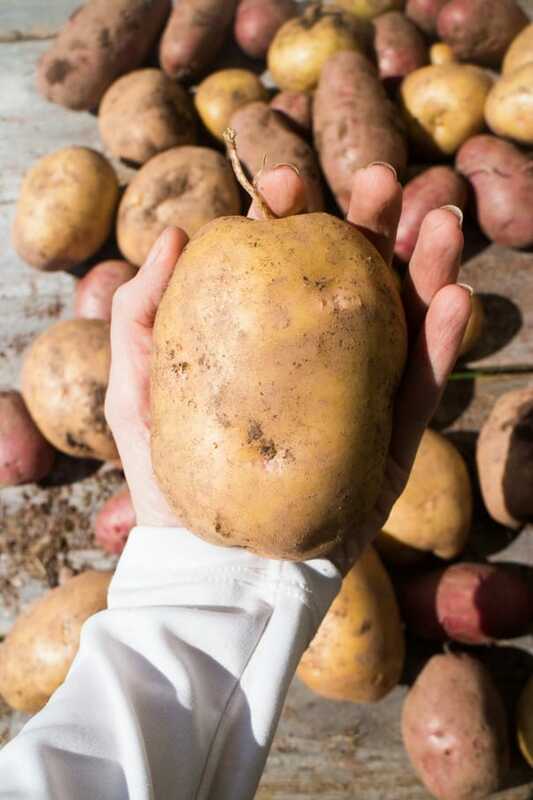 On average, it takes 90 days to grow potatoes, which is pretty much exactly the time it took ours. Depending on the variety, it might take a little longer or shorter. So here’s what this proves. Potatoes are no nonsense. You can plant them, cover with soil and leave them for months and they will still produce. Obviously, if you take better care of them (like mounding up the soil!) 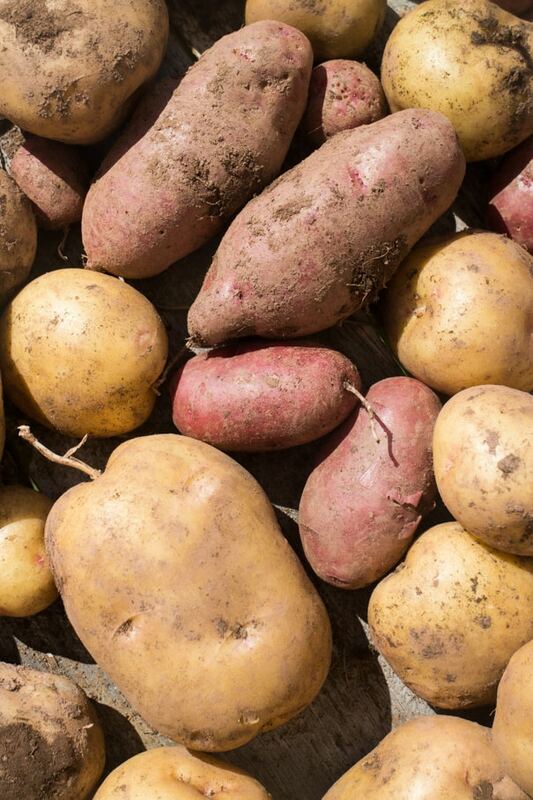 you will probably get a better yield, but even if you don’t, you’ll still get a bunch of potatoes! 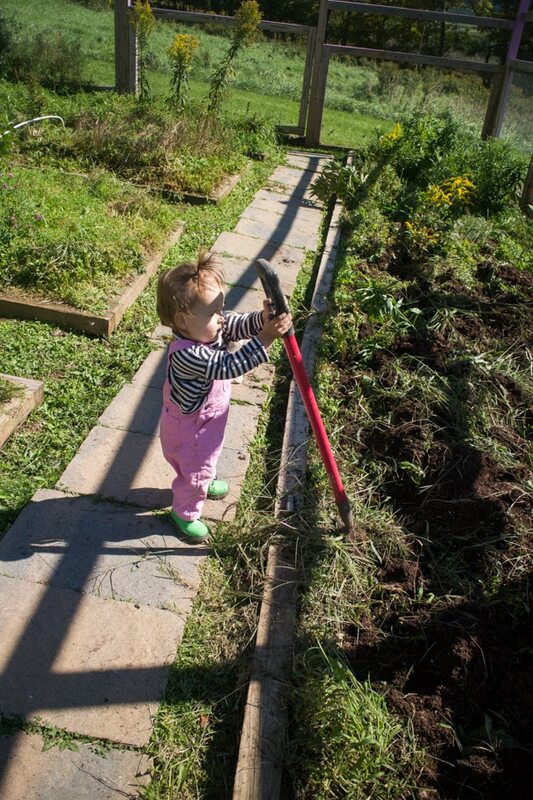 I gave our new garden helper Enceladus a shovel and told her to get digging! There were treasures to be found under the soil! Just kidding, she doesn’t dig holes (yet). But she did think it was fun to be given potatoes out of the soil to drop in a basket! And look at the size of some of these potatoes we dug up! Next year, we might have to do the same thing! Maybe we’ll even plant 2 beds full of potatoes! 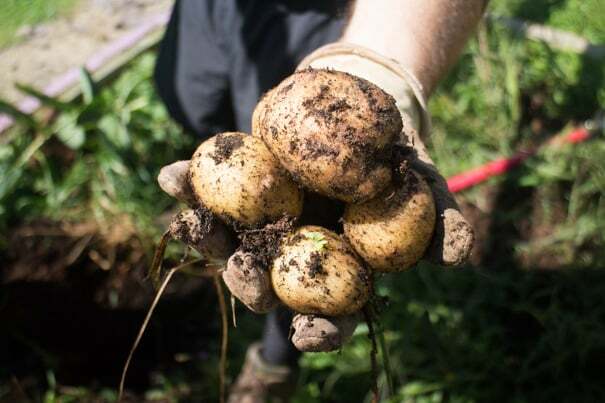 We didn’t know if the plants would grow without being watered or mounded, as we always did in the past with our potato plants, but it looks like Mother Nature took care of them for us! 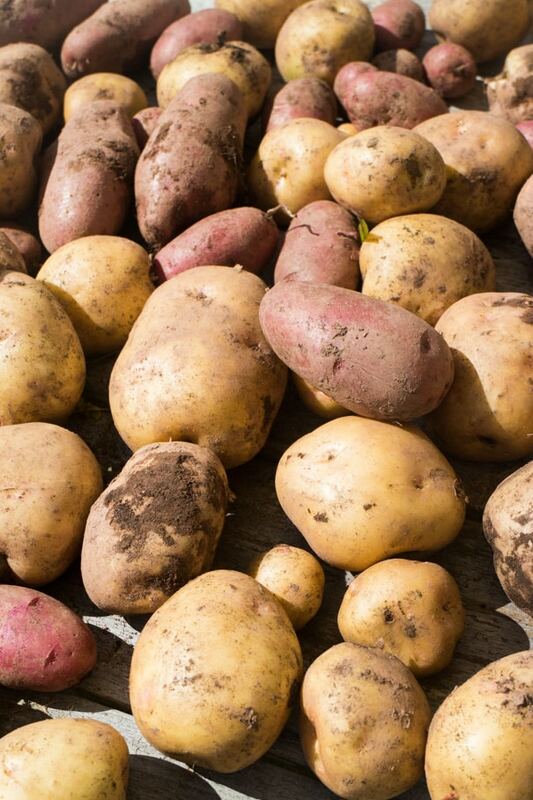 Now the hard choice – what recipes to make with our potatoes? Do you have any suggestions? Hope you enjoyed this little potato journey! 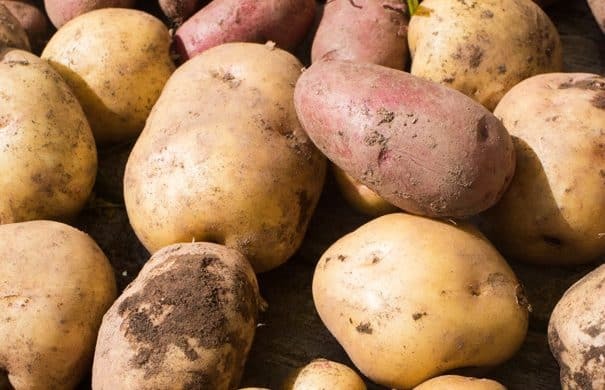 Now I will leave you with some of my favorite potato recipes! The Best Mashed Potatoes Ever! We planted potato’s, hilled them watered them, babied them. 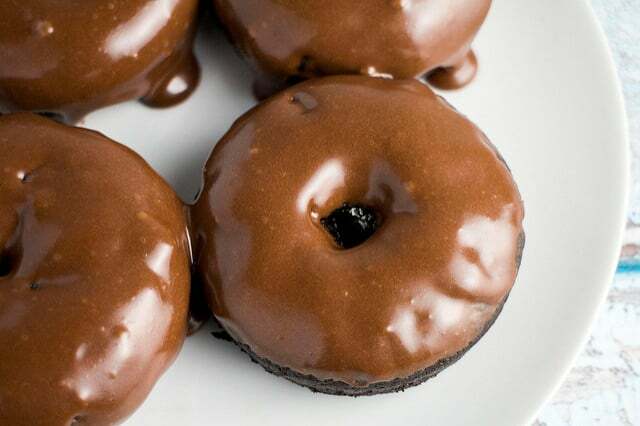 Next year, we’re doing them like you did! We got hardly any, just a big mess!!!! Does it rain during the summer in upstate New York? We didn’t get any rain here in Oregon since May so I’m not sure if it would make a difference. Hey Nicole, yes, it does rain in the Summer, so Mother Nature naturally waters for us!